Bitterness grieves the Spirit of God. Bitterness is slowing your grace and letting the enemy gain ground on you. What is bitterness? 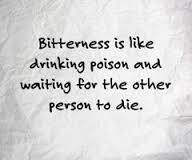 Bitterness is also understood to be resentment (also called ranklement or bitterness). It is the experience of a negative emotion (anger or hatred, for instance) felt as a result of a real or imagined wrong done. Bottom-line, bitterness will never honor the Lord. It will never advance you in your relationship with the Lord. It will never cultivate a love for God, nor for your neighbor. Believe me, bitterness can be a sin that will consume you and spread to every facet of who you are. Look to Jesus, who despite being betrayed, persecuted, hated and left to die a sinner’s death alone did not respond with insults or scorn but entrusted Himself to the Father who judges all things justly (1 Peter 3:21-23). Keep your mouth shut, when you used to blurt out a reaction.